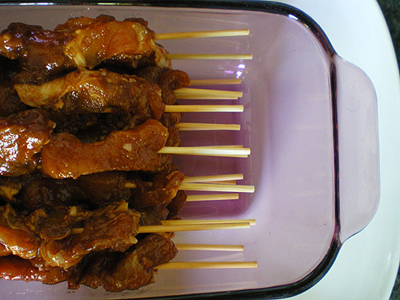 If you go to any summertime event at which a large number of Filipino-Americans are gathered, I guarantee that you will see some version of barbeque pork skewers. Often at food stands it is listed as “pork on a stick”, serving as an example of how Filipinos keep it real when it comes to food descriptions (no fancy menu language here!) Here I will just call them pork skewers as pork-on-a-stick sounds like some kind of horrible jerky or something you would feed to your dog. 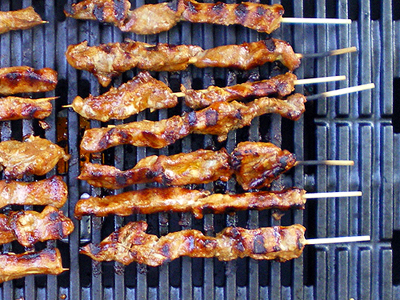 When I was growing up, my uncle made the most kickass pork skewers. I remember asking him what was in it and he always said “7up!” I thought he was full of it until my mom was like, “There really is 7up in there, you know.” I thought, “Awesome. Now that is totally summertime trashy!” When I began making my own marinade for pork skewers, I started out using 7up. There is science to it, not just shock value. (Speaking of which, I was making the marinade at a friend’s house once and she was watching me pour half a can of Coke in it — there wasn’t any 7up — and she was like, “That’s what we’re eating tomorrow??”). The carbonation helps soften the meat, and the sugar helps the meat caramelize on the grill (this is why so many bbq sauces have copious amounts of sugar). Ultimately, I replaced the 7up with pineapple juice — this gives it a really nice ‘fruity’ flavor, also a boost in acidity, but still sweet. And, as we all know from Hawaii, pork and pineapple are an excellent combination. Whenever we’ve had summer barbecues, and I would literally make a hundred of these and still have none left at the end. They are kind of like lumpia shanghai — you don’t know how many you’ve eaten until you’ve eaten too many. A couple of important factors when it comes to making the skewers: Do prepare the marinade and marinate the pork the night before. I usually give it a stir in the morning to mix things up. The pork I use is pork shoulder — it has nice amounts of fat in it that keeps the meat moist when it hits the grill. You can also use a combo of half pork shoulder and half pork belly. Don’t use lean pork — it’ll just get dry. Also the fat itself ends up being those little crunchy bits that you hated as a kid but love as an adult. Save a bit of marinade for brushing over the meat while it’s cooking (I’ve adjusted the recipe so you should have about 1/2 cup leftover for brushing when you are grilling). And last but not least, soak the skewers in water that day: it’ll make it easier to put the pork on it without it reducing to shards. It also keeps the sticks from burning on the grill. Combine all the marinade ingredients. Let it sit while you prepare the pork. Cut the pork into small pieces about ¼ inch in width. It’ll feel like the pieces are too small, but this is important as huge chunks will not cook fast enough on the grill. Transfer the pork to an airtight plastic container. Reserve about a 1/2 cup of marinade. Pour the rest over the pork. Stir, put the cover on (make sure it is sealed, otherwise everything in your fridge will smell and taste like marinade). Set in the refrigerator for 8-24 hours. In the morning, give the pork a stir to make sure it’s all distributed. Set your skewers in a container of water. About a half hour before you plan on grilling (more if you are making a lot), start skewering the pork, leaving an inch or so at the bottom of the skewer. Heat your grill as you normally do (relatively high if you have a gas grill). Grill the pork, brushing with the excess marinade everytime you turn them over. Serve with steamed rice, or, if you want to go classic pinoy fiesta-style, with pancit, lumpia shanghai and rice. I make beef ones, here’s the marinade: soy sauce, orange juice, cracked black pepper, and crushed garlic. For beef it’s better if you don’t marinate them for more than an hour; I think the orange juice disintegrates the connective tissue. We also make prawns or zucchini… and for those we just use olive oil, salt, and pepper. Brings back wonderful memories of my dad’s BBQ!! These look so good! I think I’ll be inviting you over next time I get the BBQ out! Wow! Those bbq pork skewers look delicious, perfect for a summer evening party. BTW, I simply love your blog, all of the interesting posts with recipes, food-related news and life-lessons are so interesting. Sheryl, thank you you so much for your website! I’ve made many things from your blog, and I plan to make many more. I’ve made the chocolate syrup which I used to moisten a chocolate malt cake, your chocolate malt, your perfect waffle recipe and now I have pork marinating and skewers soaking for BBQ! Next I am planning your Philadelphia style ice cream. Thank you, Thank you, Thank you!!! KC– glad you like the recipes!! That definitely inspires me to post more.